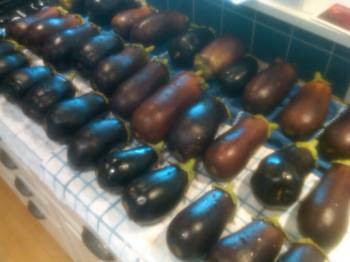 Word to the wise: eggplants are very productive vegetables. 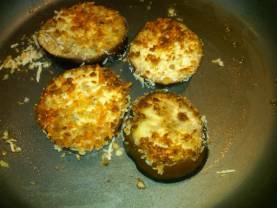 If you have a lot of eggplants, this is a great recipe to double, triple or quadruple. So it's a great group project for your garden club, and everybody can take some eggplant "patties" home and use their own pasta sauce and mozzarella cheese to bake and eat. You just bake the eggplant "patties", let cool, and set aside the ones you want to eat right away. The others, you stack, double-wrap in freezer bags, mark with an expiration date a year from now, and put in the freezer. They'll keep for over a year that way. Then, when you want to make Eggplant Parmesan again, you simply thaw some out, add pasta sauce and mozzarella cheese, and bake. Yum! With a basting brush, brush olive oil on two cookie sheets. Whisk eggs with water in one dish, and mix breadcrumbs with Parmesan and spices in another dish. Cut each eggplant sideways, producing rounds that are about a half-inch thick. Discard the very top and the very bottom. Dip each round in the egg mixture first. Shake it a little to drain the excess. Then press it on both sides into the Parmesan-breadcrumb mixture. Place prepared eggplant "patties" onto the oiled cookie sheets and bake in a preheated 375-degree oven for about 20 minutes per side. For Eggplant Parmesan, you simply spray PAM into a baking dish or again brush olive oil, and place one layer of eggplant rounds into the dish. Top with half of the pasta sauce and a sprinkling of mozzarella cheese. Then place another layer of the eggplant rounds on top, and repeat with the remaining half of the pasta sauce and some more mozzarella. Bake for 15-20 minutes, and serve. This is a nice main dish to serve to friends who are vegetarian; a nice thing about gardening is that it helps you show hospitality and thoughtfulness to everybody, including those who don't eat meat but still like tasty food!